It’s an odd looking bone, but that makes it distinctive, so I wasn’t too surprised that everyone recognised it as being from something aquatic. In particular, Ric Morris and joe va both recognised it as the radius of a pinniped. 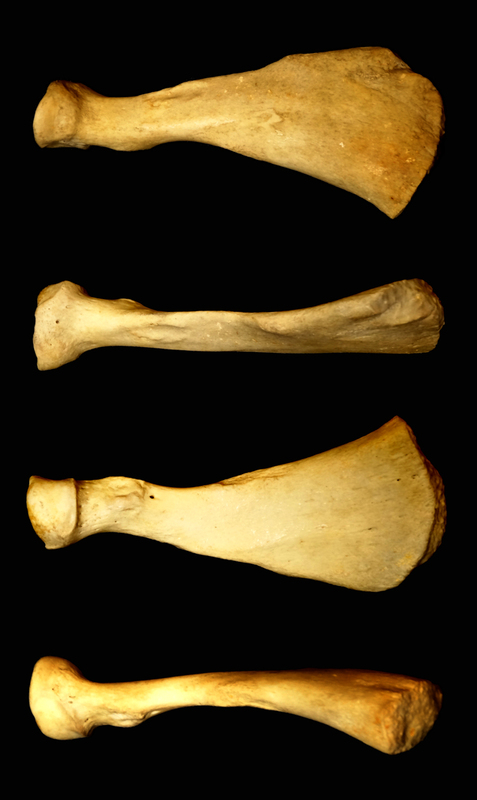 The broad end that articulates with the wrist is lacking its epiphysis, indicating that this is from a younger animal. This also makes it a little harder to make a definitive species identification. I think that Ric Morris’s cleverly disguised suggestion of Grey Seal is pretty good, although I’m leaning slightly more towards Harbour Seal Phoca vitulina Linnaeus, 1758. The odd shape is of course one adaptation of the forelimb that reflects a change in biomechanical requirements away from the load-bearing limb of a terrestrial ancestor and towards the hydrofoil shape and drag-force-resistant flipper of an active aquatic pursuit predator. I will never ceases to be impressed by the power of evolution as a mechanism to reshape bone to better suit new purposes!